Where: Near Kangaroo Valley, NSW. McPhail’s mountain bike ride is a mixture of fire trails and single tracks. It runs for approximately 13km through some amazing scenery. Your heart will also be pumping as you fly down some of the steep descents. The tail isn’t all that technical, however you’ll need to be wary of your speed on the descents as the trail is steep in parts. McPhails fire trail drops approximation 600m so it’s one exciting MTB ride with plenty of switchbacks. You might want to consider a car shuffle if you don’t want to slog your way back up. Directions to McPhails fire trail. Google Map Link. The trail end is on Moss Vale Rd just down from Fitzroy Falls. Use you google map link to assist you with directions. Below is a picture of McPhails Trail Head. McPhails Fire Trail Trail Map. McPhails mountain bike trail Photo Gallery. Directions to McPhails Mountain Bike trails. 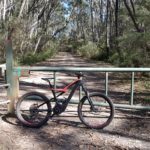 The McPhails MTB trail head is on Moss Vale Rd just down from Fitzroy Falls. Use you google map link to assist you with directions. Below is a picture of McPhails Trail Head. 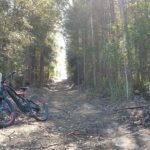 Mountain bike riding southern highlands, southern highlands MTB trails, southern highlands mountain bike tracks, tracks, trails, southern highlands mountain bike park, McPhails mountain riding, McPhails mountain bike trails, Kangaroo Valley mountain bike trails.